My journey began at Kristiansund, a town near the Norwegian Sea, setting off along a “trippy” highway known as the Atlanterhavsvegen, or Atlantic Ocean Road. An amazing engineering feat that is more roller coaster than road, the 5-mile-long highway loops high over the small islands that hug the coastline before dropping down and skimming the “brooding, steel-gray” waves of the ocean. 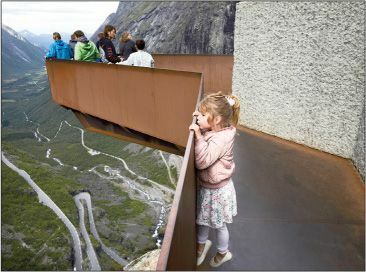 Here, a pair of young architects from Oslo have constructed an elevated hiking path, called Eldhusoya, that meanders around one of the most picturesque islands. Farther south, I drove up the Trollstigen (Trolls’ Path), navigating 11 switchbacks cut into the sheer mountainside. The sharp turns required all my concentration, but I stole glances at the breathtaking surroundings: “trees with brilliant gold, russet-red, and pumpkin-orange leaves, sculptural mountain peaks stretching up into a lonely foreboding sky.” At the top of the road, I found a modernist café with a tranquil, Zen-inspired pool; beyond it, a rust-colored observation platform hung from the mountainside, offering a sweeping view of the Romsdal Alps. As I became more confident in my driving, “the peace and diversity of the countryside became meditational.” I passed Hobbitlike cottages, built into mounds of earth with grass-topped roofs. “Dark thick forest alternated with sun-dappled farmland and bare, desolate mountains overlooking quaint lakeside towns.” Spectacular installations erupted suddenly in remote corners, far removed from civilization. “They sometimes seemed like a figment of my imagination.” At Juvet Landscape Hotel (juvet.com), doubles start at $219.